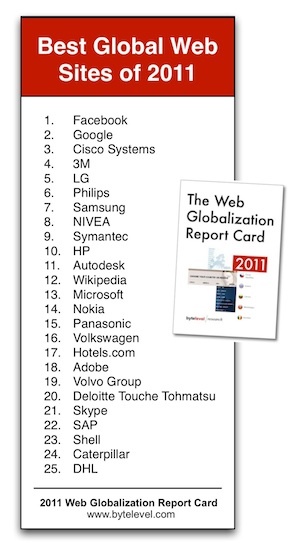 I’m pleased to announce the publication of the 2011 Web Globalization Report Card. This year, we reviewed 250 web sites across 25 industries. The web sites represent nearly half of the Fortune 100 and nearly all of the Interbrand Global 100. Companies like 3M, Cisco, Philips, and NIVEA have become regular faces in the top 25. But there are some new faces as well. There are five companies new this year to the top 25: Volkswagen, Adobe, Shell, Skype, and DHL. Although these 25 web sites represent a wide range of industries, they all share a high degree of global consistency and impressive support for languages. They average 58 languages — which is more than twice the average for all 250 sites reviewed. 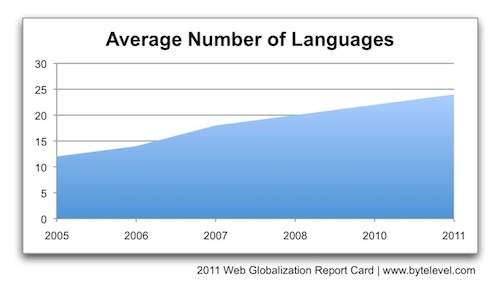 The average number of languages supported by all 250 web sites is 23, up from 22 last year. 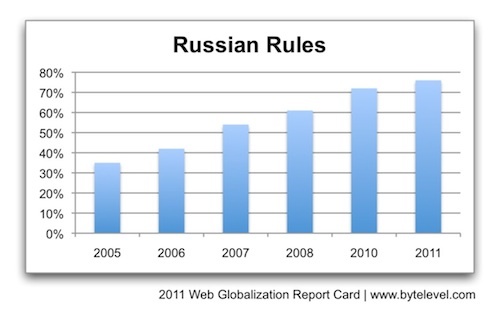 As the visual below illustrates, language growth over the years has been amazing. Seven years ago, I was thrilled to find a web site with more than 20 languages. Today, 20 languages is below average. Language is just one element of web globalization, but it is the most visible element. When a company adds a language, it is making its global expansion plans known. If you want to know where your competitors are betting on growth, spend some time looking at their local web sites. More than twenty companies added four or more languages over the past 12 months. In the Report Card, languages account for 25% of a web site’s score. We also evaluate a web site’s depth and breadth of local content, the effectiveness of the global gateway, and overall global consistency. Beginning in 2010, we have also begun tracking how companies promote local social platforms such as Facebook and Twitter around the world. Our goal was not only to highlight the leaders in language but to identify those web sites and services that were globally “well rounded” as well as innovative. The top 25 web sites are not perfect. The Report Card details many ways these sites could be improved (including Facebook and Google). That said, the executives who manage these web sites and services deserve a great deal of credit. As someone who has worked as both a consultant and an employee at companies such as these, I know how challenging it can be to get the funding to add languages and staff and to educate various teams on the many complexities of web globalization. While it may be the company names that appear on the top 25 list, it is the hundreds of passionate and bright people who got them there. Good point that companies should use the newly localized languages of competitors’ websites as clear indicators of where they plan to target next! I am surprized that Chinese and Brazilian Portuguese are not listed among the top growing languages.